Border Guard Bangladesh (BGB) arrested 32 Burmese Rohingyas and one Bangladeshi human trafficker trying to enter Bangladesh at Shapuridip in the early morning of 27 January, according to Sayed Hossain, a Teknaf local. He said that they had crossed the Burma Bangladesh border by motor-boat to go and visit relatives. According to BGB officials, after a tip-off a BGB team led by Company Commander Gulam Rabbani from Shapuridip BGB outpost under Teknaf Battalion No. 2 arrested the Burmese nationals trying to enter Bangladesh after carrying out an operation in the border area. Of the passengers who were arrested 12 were children, six were female and eight were male. Six Burmese Rohingya crew members and the Bangladeshi trafficker were also arrested. Lieutenant Colonel Md. Abuzar Al Jahid from BGB Teknaf Battalion No. 2.said that the six crew members and the trafficker were handed over to to the police at Teknaf Police Station so that the police could investigate further. 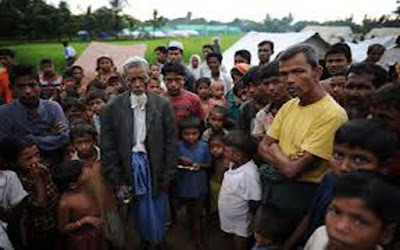 He said that the remaining 26 Rohingyas will be kept in custody at at the Shapuridip BGB outpost and will be repatriated to Burma after the BGB have carried out an investigation. Mohammed Ataur Rahaman, the Office-in-Charge (OC) at Teknaf police station, said that the police charged the Bangladeshi trafficker and the six crew members with illegally trafficking people into Bangladesh. The case was due to be heard in the Cox's Bazar Court on 28 January.